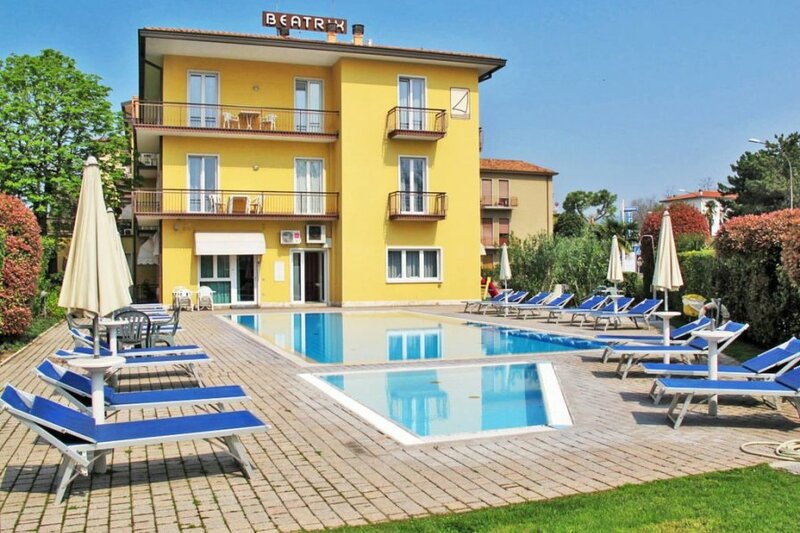 This 1 bedroom apartment with swimming pool is located in Bardolino and sleeps 4 people. It has WiFi, air conditioning and barbeque facilities. Apartment, 2 - 4 people, 2 room/s, 1 bedroom/s, 1 bathroom/s, approximately 40 m², 1 floor/s, apartment on ground floor or upper floor. Feature: Property in a residence (24 units in total). Equipment: satellite TV; internet access Wi-Fi (included); safe; combined heating/air conditioning. Heating/air-conditioning if required, € 10/​day. Holiday resort tax. Linen/towels available. Change of bed linen/towels, € 10 per person. Deposit € 70 (in cash). Toddler bed € 6.50 per day (on order). High chair € 1.50 per day (on order). Pet 1 pet allowed, € 7 per day (please advise prior to arrival; additional pets on request only). Pool (shared use): 10.0 x 5.0 m, open throughout the entire season, children's pool. Pool area: sun loungers, sunshades, external shower. Infrastructure: reception; washing machine (coin-operated). Plot description: 1 x parking on the estate; 1 x parking on the estate (depending on availability). Balcony or reserved open space, furnishing provided. The apartment is described as good value for money. This apartment is located in Bardolino. It is set in a very convenient location, just 0 metres away from a beach and only 600 metres away from the city center.